The Fan-Thom II gives you everything that the Fan Thom does plus it comes with a threaded thermostat that screws into the engine block or manifold for a professional installation. Thermostat thread size: 3/8"-18 NPTF fitting. Installing air conditioning to your hot rod? Need cooling fan relays to operate off of a thermostatic switch and when your a/c is on? The dual activation cooling fan relay kits by Painless Performance are exactly what you need. Only a few minutes for the installation and your cooling fan will come on when the engine reaches the preset temperature of the thermostatic switch mounted in the engine head or when the a/c is turned on. These Painless Electric Fan Relay Kits offer everything that the Weatherproof Electric Fan Relay Kit does while adding thermostat protection. Two choices of thermostat switches are available, 185°F On/175° Off and 195°F On/185° Off. This kit is designed for running high amp dual fans or Monster fan set-ups. PCM controlled fan relay kits contains the necessary length of wire and pin-outs for those wishing to control their fan operation using the vehicle's power control module rather than thermostatically. Also available in a Weatherproof version. 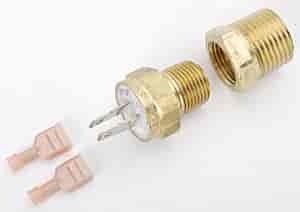 This Fan-Thom II kit comes with a threaded thermostatic switch that screws into the extra coolant temperature sensor port of the passenger engine head on Generation III and up GM engines for a professional looking installation. This is inexpensive protection for an electric fan and a vehicle's wire harness. Provides constant voltage, protects from voltage and amperage spikes and prevents the fan from back feeding voltage through the vehicle's wire harness. Also available in a Weatherproof version. 30110 is rated 2.5 out of 5 by 2. Rated 4 out of 5 by Smartguy from sending unit works well. I bought two of these to replace two of the older kind in order to get the positive ground. This works much better.